Visit our new interactive Brewery museum open 7 days 9am – 5pm. 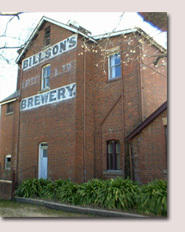 Find out about the history of brewing and beverage manufacturing in one of Australia’s iconic gold rush towns. Then try our heritage cordial range for yourself at our renowned tasting table. A memorable trip back in time all age groups will enjoy! A collection of twenty horsedrawn vehicles recalling transport of the 19th and 20th century. Many vehicles remain as a direct link with Beechworths' past. Open daily - 9am to 5pm.